A frail and fragile bird – in this case a young woman turning 18 – is trapped in a glass cage – in this case her mother’s hermetically sealed house with an airlock instead of a porch – unable to leave for fear that a cat – in this case the nasty germ-filled world – would kill her. Welcome to the world of Everything, Everything. 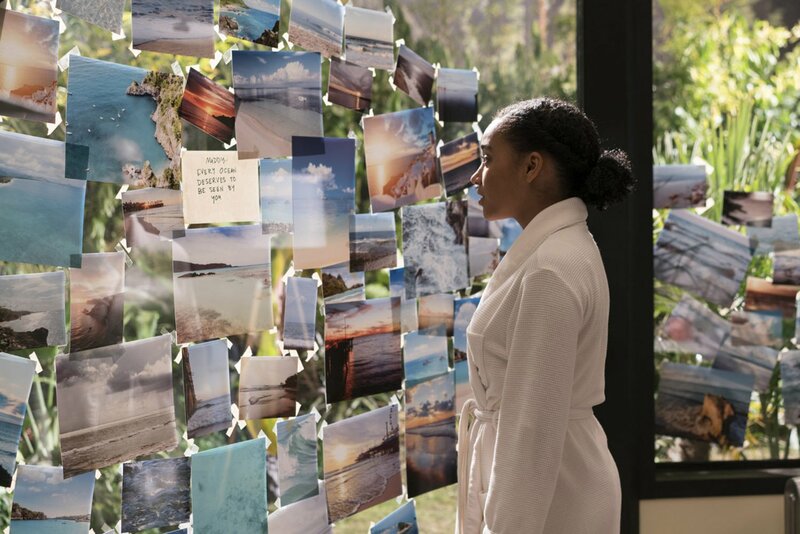 Maddy’s life revolves around her Mum (a doctor played by Anika Noni Rose), her nurse Carla (Ana de la Reguera) and Rosa, her nurse’s daughter (Danube Hermosillo). No one else enters the house due to her severe combined immunodeficiency (SCID). 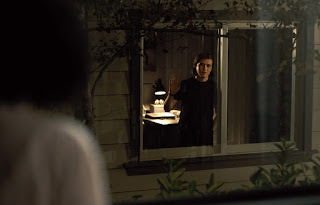 Then a boy moves in next door. 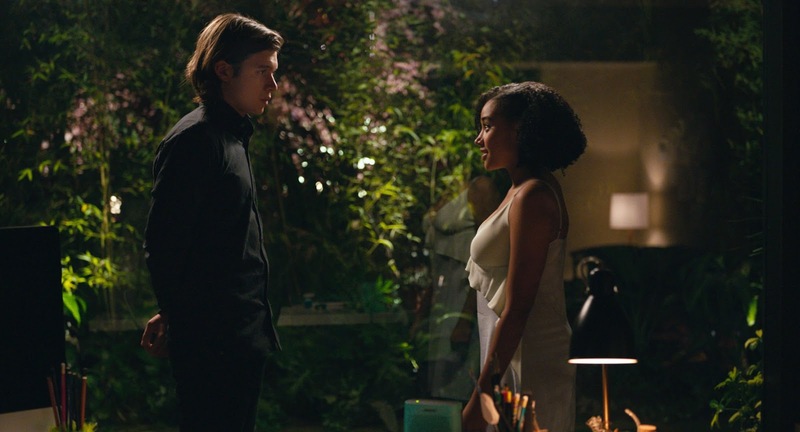 Whereas Maddy (Amandla Stenberg) wears nothing but white clothes in her obsessively clean house, Olly (Nick Robinson) always wears black. 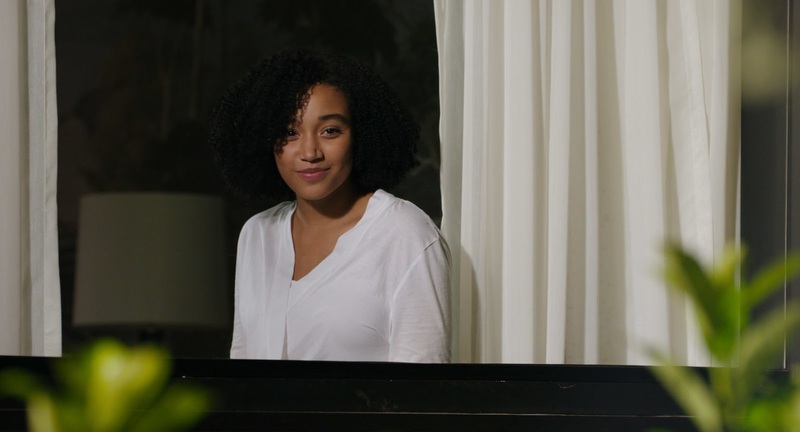 She sits on her wide windowsill and gazes over at his bedroom window. It’s like the cinematic version of Dawson’s Creek. Except her window doesn’t open, so there’s no need for a ladder. Which is shame as the ladder was what made Dawson’s Creek into magical television. If a review of a theatre production obsesses with the set and the lighting then it’s often a sign that the script or the story or the acting wasn’t up to scratch. This film deserves much praise for its cinematography. You’ll spend much of the 96 minutes noticing that there’s not a single bad shot. Each scene feels like it meets Da Vinci’s golden ratio. 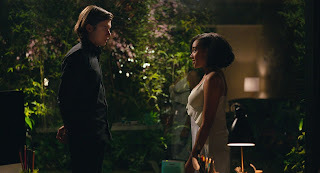 The colour palette is gorgeous, extending to the costumes, with Maddy journeying from simple white t-shirts to fancier and fancier tops of various pastille shades, and (tiny spoiler) Olly eventually ending up in a white t-shirt. There’s much creativity in the different ways that Olly woos (though at the start I’m not certain that he knows he’s wooing) Maddy through the scenes he creates out the window. There’s also creativity in the director’s freedom to use animation – though in a way that marks the film as a teen flick rather than a film aimed at an adult audience. The way that Maddy’s inner feelings are represented by a spaceman adds some humour. Transforming remote text and phone conversations into the characters pretending to sit facing each other across a diner booth, or shouting across a library, works well as reality has long since been suspended. However, and there’s a big sigh that goes along with that ‘however’, it all becomes a bit much, particularly when the protagonists’ inner feelings start to appear as subtitles while they have a conversation. At first Everything, Everything looks like a coming of age movie. And there’s just enough of that developing intimacy to keep it a 12A. But it’s really a finding out the truth movie. Except the truth is pretty well signposted if you’re paying attention from the start, and given the various moments of peril and the resolutions to the conundrum of life versus love, it totally fails to elicit an emotional response from its audience, never mind tears. I’m the world’s easiest cinemagoer to reduce to floods of emotion. Even Maudie managed it last week! 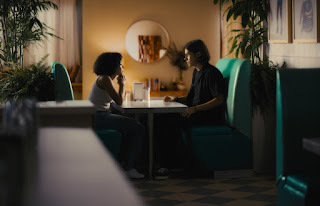 But the dominoes set up by director Stella Meghie are strangely cold and fail to trigger any sense of melodrama or histrionics, despite at one point the soundtrack switching to “Please don’t take my love away” with thunder rumbling in the background. While Stenberg makes the most of the character she given – Maddy seems to have lost the younger-than-her-years, depressed feel of the book – and develops her confidence in steps, Rose is less believable as the mother, with a particularly unconvincing confession speech that seems disconnected from her heart. Teenagers out on a date will be able to chat, snog, crunch popcorn and generally not pay attention to the screen and yet leave the cinema with a complete grasp of every intricacy of the plot. Clearly forty four year old me is not the intended audience. I’m perturbed by the fact that Maddy isn’t ever billed for her bottomless credit card, and demonstrates that she is well-educated but doesn’t seem to appreciate that air passengers spend a few hours breathing in and out each other’s recycled breath. And even more perturbed that the airlock allows you so easily open both doors at once, defeating its whole purpose.